Bonus points for anyone that remembers my poor, neglected Picnic Point quilt. What can I say? I have QCD ~ Quilt Completion Disorder. I actually love this quilt! I finished the top last August and basted it last November. I have no idea why I didn't quilt it right away. Well, I have some idea - holidays, travel, and other distractions. Forgotten no more! This week is dedicated to finishing up this lovely. I had a question recently about how I "fit" the quilt in the space to the right of the needle while I'm quilting. I thought I'd show just how great it fits in there, when you roll it up nicely from the end. Now, my BERNINA 750QE does have quite a bit of space to work with there (10" right of the needle and great height). But using this method I'd quilted up to a large Full Sized quilt on my BERNINA 440QE (8" right of the needle and less height than the 750). It did take patience, but I did it and the results looked wonderful. My goal is to finish quilting today, bind tomorrow, and take pictures Thursday. 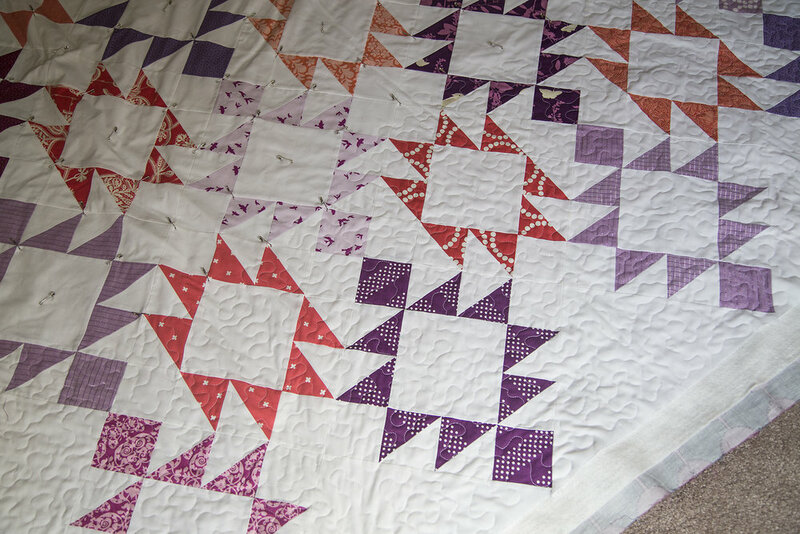 So hopefully the next post you see here will be a completed Picnic Point quilt in all it's glory.